Wilbert D. Sleep and Jean (Meredith) Sleep had one son, Meredith D. Sleep, born on April 13, 1899, in St. Louis, Missouri. When he was counted in the U.S. Census of 1900 in Cicero, Illinois, the son still bore his birth name. In 1910, though, after his father was gone, he was called Lewis Beyers. The name change had come about because of Jean Meredith's marriage to a widower, Henry W. Beyers (dates unknown). In 1920, the name of Jean Meredith's son changed again. This time he was L. Meredith Beyers. (In 1910 and 1920, the Beyers family lived in Evanston, Illinois.) Henry W. Beyers died in 1936, probably in Chicago, but by then Jean was out of his life and long gone. Here is a curiously brief and relatively uninformative newspaper item from the Buffalo Evening News, February 20, 1922: "The marriage of Mrs. Jean Meredith Beyers of Evanston, Illinois, to Charles M. Ransom, will be quietly solemnized in Pasadena, Cal." So what happened in the marriage of Henry and Jean Beyers? Who knows. But in marrying Ransom, she seems to have finally settled, as she spent the rest of her life in Pasadena. Ransom, who had come from Buffalo, seems to have been a wealthy man. He had been a manufacturer of medicines in his hometown. In Pasadena, he switched to another kind of medicine: wholesale liquor. Ransom died in Pasadena in 1955 at age eighty-seven. Jean Meredith Ransom, who was selling real estate in 1940, survived him by seven years. She died on February 1, 1962, in Pasadena, at age ninety-two. Both were buried in Buffalo. So, two big personalities have pushed Meredith Beyers, the subject of this biography, to below the fold. Well, when he was a child, he had this name and that to go along with whatever man was married to his mother. In the earliest record I have from his adulthood, though, he called himself Lewis Meredith Beyers. The record is his World War I draft card, filled out in 1918 when he was nineteen. Beyers was a student in the college of engineering at Northwestern University at the time. Not long after that he was inducted into the U.S. Army, with dates of service of October 5, 1918 to January 17, 1919. Meredith Beyers attended Northwestern University and Harvard University. He was an engineer, mathematician, and physicist and worked in aerospace at Indian Bay Research Corporation in Michigan and at Convair and Ryan Electronics in California (probably other places, too). I don't know when he moved to California, but he married Florrie May Gosse, on November 8, 1958, in San Diego. She was a Canadian-born teacher. They were close and loving. In their dotage, they walked hand in hand to lunch every day. In 1966, Beyers came out of retirement to help with elections in San Diego County. An astute and exacting man with figures, Beyers kept election results in line for years. "He's always 100% on the mark," his wife said. What's missing in all of this is an account of Beyers' young adult years, a time when his work wasn't so entwined in science and mathematics but came closer to matters of the occult, or at least to a cult of personality. Sometimes I think that human history is just a chronicle of personalities. Meredith Beyers is a good example. He lived nearly a century, married for the first time and got a new job at age fifty-nine, started working in county elections in his sixties, and was writing away on half a dozen books in his eightieth year. "You can't sit in a rocking chair and watch TV and expect to grow into your 80s gracefully," Beyers said, and he lived by that credo. When he was young he wrote poems and stories, when he was in middle-aged he worked as an aerospace engineer, and when he was old . . . well, maybe Meredith Beyers never got old. There were big and irrepressible personalities in Beyers' family before him. His grandfather, Welsh author and preacher Lewis Meredith (1826-1891), took to the pulpit at age eight. In his twenties, he preached in front of Wesleyan congregations, worked for a printer, and founded a literary society. Taking the nom de plume Lewys Glyn Dyfi, he published, at age twenty-six, a collection of his own verse entitled Blodau Glyn Dyfi. Three years later he was accepted to the ministry, and in the late 1850s or so, he went to the United States, to Chicago, there to preach as well. He continued to write, too, sending back to his home country pieces for a couple of Welsh-language magazines. In 1863 Meredith returned to his native land to advocate for the Union cause in the American Civil War. Once again he went to the United States and preached in Chicago. Known as "the bard of Glyn Dufvy," Meredith died in the Chicago suburb of Oak Park in 1891. Meredith's brother, Richard Meredith (1826-1856), was also a writer and a lay preacher. Meredith and his American wife Millie had two children, a son, Arza, and a daughter, Jean, nicknamed Jennie, who was born on May 13, 1872. Jean Meredith's son, Meredith Beyers, remembered her as a great beauty--an international beauty, in fact, who "captured the heart of none other than the crown prince of Germany." When she was young, Jean slid down a rope from her upstairs bedroom to go to dances, even as her father read the Bible in the downstairs parlor. She attended Northwestern University when few women did such things and was a member of Kappa Alpha Theta. After spending a year in Europe, she married, on April 15, 1897, in Oak Park. Her new husband, Wilbert Douglas Sleep (1872-1930) of Halifax, Nova Scotia, was supposed to have been well connected but worked as a salesman. By 1910, Sleep was out of Jean Meredith's life but not before fathering her only son. And in July 1930, with his residence given as Elgin State Hospital--yes, a mental hospital--he died in or near Peoria, Illinois. According to a description of the Ingo Swann Papers in the Ingram Library Special Collections at the University of West Georgia, Sylvia Leone Mahler was a pseudonym used by Edith Chandler Haubold. I'll take the library's word for it, as I haven't been able to find anyone named Sylvia Leone Mahler in public records or historical newspaper accounts. So . . .
Edith Chandler Walker was born on January 21, 1900, in Azusa Township, Los Angeles County, California. Her parents were Charles H. Walker, a physician, and Lilian (Chandler) Walker. Tragically, Lilian Walker died on January 28, 1900, only a week after the birth of her daughter. Dr. Walker was left to rear his three girls, the twins Bertha Ellinwood Walker and Ethel Bardwell Walker, and the new baby, Edith Chandler Walker, on his own. However, in 1910, when the census taker came around, his mother-in-law, Stella B. Chandler, was there to lend a hand. The Walker family lived in South Pasadena then and for years afterwards. Edith C. Walker graduated from South Pasadena High School in 1917. Twelve years later, in 1929, she married Georgia native Moritz Casper Haubold (1888-1966). He had been married before. Considering the ages of his previous wife and daughter and the year of his filling out his draft card--1918 the year of the Spanish Influenza--I hate to think what happened to them. Moritz C. Haubold was nearly deaf, but the Haubold family got by. In 1930, he was working as a shipping clerk in a department store. By 1940, he and his wife had had a daughter, Lila J. Haubold. They lived in various places in southern California over the years, in South Pasadena (1930), Pasadena (1935), Monrovia (1940), and Temple City (1942). By that last date, Haubold was retired due to a disability. 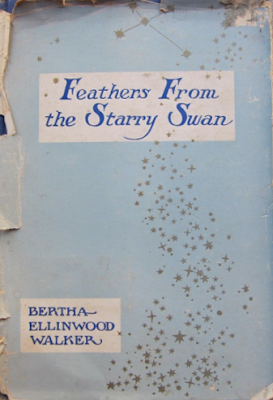 Feathers from the Starry Swan by Bertha Ellinwood Walker, illustrated by Edith C. Haubold. Bertha E. Walker was of course Edith's sister. Her book was issued in a hardbound edition of 500 copies in 1940 by Harvey Parker of Hollywood, California. "Colleagues" (short story) in Weird Tales, May 1943; reprinted in Weird Tales Canadian edition, September 1943. 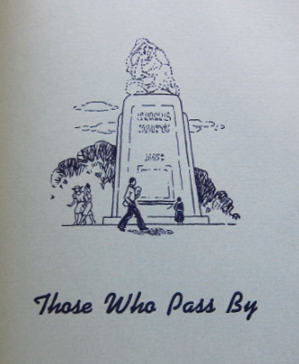 Symbolic Drawings and Interpretive Poems by Sylvia Leone Mahler and Nazir Hassan, published in Los Angeles by Arrowswift Press in 1947. "Of a Little Jade God" (poem) in The Beacon, April 1948. 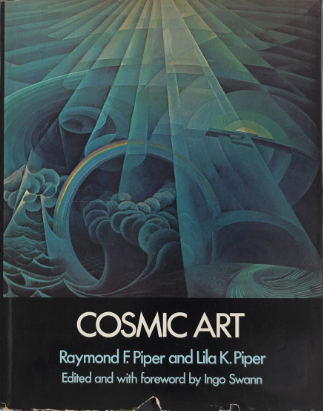 The book mentioned here is Cosmic Art by Raymond F. Piper and Lila K. Piper, edited and with a forward by Swann (1975). Cosmic Art does indeed have at least one piece of art by Sylvia Leone Mahler. (1) We should also remember that Pasadena, California, was kind of a hotbed of occult activity in the 1930s and '40s. Scientist and occultist John Whiteside Parsons (1914-1952) lived there, as did L. Ron Hubbard, at least for a time. Anyway, Marian Pullen's letter of 1976 to Ingo Swann was too late: Edith Chandler (Walker) Haubold, aka Sylvia Leone Mahler, died on May 23, 1972, at age seventy-two. She was buried at Rose Hill Memorial Park with her husband, who had preceded her in death in 1966. Sweet fruit, soon tasted, gems too gladly sold . . .
Wind, fill afresh the slack sails of my yearning . . .
No footprint on this shore and no returning. Mirrors, redoubling vestiges of sun. And reap no harvest from the fleeing foam . . .
Let me set sail for the strangest harbor--home . . .
Where spent tides still the restless pulse of ships. The hawser to the rusted mooring-ring. And strange new harbors, in remembered eyes. (1) In case you're wondering, Lila K. Piper was not Lila J. Haubold. She was actually Lila (Kehm) Engberg Piper of Mason City, Iowa, later of Syracuse, New York, and much too old to be the daughter of Edith Haubold. The front cover of Feathers from a Starry Swan by Bertha Ellinwood Walker, sister of the illustrator, Edith Chandler (Walker) Haubold, from 1940. An interior illustration from the same book. And the front cover of Cosmic Art, in which at least one piece of artwork by Edith Haubold, working under the name Sylvia Leone Mahler, was published. By the way, it occurs to me that Sylvia Leone Mahler may be a symbolic or totemic name: Sylvia for the forest, Leone for the lioness, and Mahler for a composer of sweeping Romantic music. Edna L. Bell was born on May 5, 1877, in Maine to Richard and Mary J. Bell. She lived with her family in Springfield, Maine, in 1880. In about 1887, the family moved from Gardiner, Maine, to northern Wisconsin. They moved again, to North Carolina, sometime after that, perhaps in the 1890s. When she was still a teenager (a word that didn't exist then), Edna Bell married a man named Elmer L. Case (1870-1935). She lived with him in Louisiana, and that's where her two daughters were born. First came Evern C. Case, born exactly a week after Edna's sixteenth birthday. Next came Veva B. Case, who was born in April 1895. Edna's estranged husband wanted the girls for a two-month visit, and so he took them to Mississippi with him in the spring of 1899. Edna was supposed to have them back by Evern's sixth birthday. Instead Case kept them, and so Edna's sister, Elvia M. Bell, then just twenty-five or twenty-six years old, resolved to go after the girls and fetch them back to their mother. What followed is enough for the plot of an exciting movie: Elvia took a train to Ocean Springs and, enlisting the sympathy and aid of a hotel keeper and a local newspaper reporter, got Evern and Veva back from their father. Elvia and her nieces were going to try to evade him by way of a riverboat, but that plan was blocked, so they rode in a carriage to a local railroad station. "[T]hrough Mississippi mud and water" they rode, dodging a town quarantined for smallpox along the way. They made it to the train but were confronted there by Case's father, who had gotten on board and threatened to have Elvia arrested for kidnapping. He was put off, but a number of police officers got on at the next station and began a search for the fugitive party. Failing in that, the men left the train, but more police officers got on in Mobile, Alabama. After battering open the door behind which Elvia and the children were hiding, then chasing them through the train, these men took Elvia, Evern, and Veva into custody. A quick trial followed. Elvia M. Bell, described as "a brunette of distinguished appearance and [. . .] considerable intelligence," was awarded the children and returned to Greensboro with them in happiness and triumph. The Greensboro Patriot called her "a heroine" for her actions. In 1905, Richard Bell moved his family to Wisconsin, where his son, Merton J. Bell, was in the logging and milling business. Father and son worked side by side in building up the business. They also founded two towns, at least one of which, Bellwood, Wisconsin, is a thing of the past. Then came more marriages for Edna Bell. First was to a man named Galle, who resided in Minneapolis, Minnesota. I have found a name, E.E. Galle, head of a cranberry-growing operation based in Minneapolis. I can't say for sure whether he was Edna's husband. Whoever that husband might have been, Edna's younger daughter Veva began using his last name. When Veva married in June 1918, her mother's name was given as Mrs. George M. Seward of Nicollet Avenue, Minneapolis. That means that sometime in 1917 or 1918, Edna L. Bell Case Galle married George Morton Seward (1856-1926), originally from Bloomington, Indiana, and later of Chicago, Illinois. Seward was in accounting and real estate. He may have gotten himself caught up in some financial shenanigans in the early part of the century. If so, maybe the scandal attached to him equalled or exceeded any scandal involving his wife because of her first husband or her now multiple marriages. Maybe they formed a kind of bond between them as a result. Maybe I'm speculating too much. In any case, Edna Bell Seward may have enjoyed some amount of happiness with Seward. She became associated with the Indiana Club of Chicago and the annual Hoosier Salon art exhibit in that same city. In 1922, she composed the lyric for the song "Indiana, We're Coming Home." The music was by Captain W.J. O'Callaghan, director of music at Culver Military Academy in Indiana. (3) In 1923, Edna's poem "To 'Laddie Boy'," composed upon the death of Warren G. Harding, appeared in the Wausau (WI) Daily Herald. (4) She had a letter in "The Eyrie," the letters column of Weird Tales, in March 1924. In May and June 1924, her serial "The Lacquer Dressing Case" was in Real Detective Tales. (The May issue was the last published by Rural Publishing Corp, also publisher of Weird Tales.) She capped all of that off with her lone story for the magazine, "The Land of Creeping Death," in June 1927. In the meantime, her husband died, in 1926. After that, she went from place to place. In 1930, she was in St. Paul, Minnesota, with her daughter Evern and Evern's husband Ashton K. Smith. In 1940, the three resided in Queens, New York. Late in life, Edna Bell Seward wrote scads of letters to the editors of the Oakland Tribune, San Francisco Examiner, and other California newspapers. She was at the time living in California, and that's where she died, on July 22, 1963, in Alameda County, at age eighty-six. And what of the others who were part of the adventure of 1899? Well, Elvia Bell married her college sweetheart, John M. Graham, and lived in Duluth, Minnesota, for many years. For part of that time her niece Veva lived with her. Evern Case, who married Ashton K. Smith, also lived in California late in life. She died there like her mother before her, in 1981. As for Veva, she married Ensign Allen Baker of the U.S. Navy in Philadelphia in June 1918. They were divorced in Dade County, Florida, in 1927, but not before they had had a son, Welles A. Baker. He had seven children. We can only hope that the story of the kidnapping from 1899 survives among his progeny . . . But there's one more thing. Both Evern and Veva went by the last name Foley at some point in their lives. That makes me wonder whether Edna Bell Case married someone by that name, after Elmer Case but before the mysterious Mr. Galle. I guess we should remember that not every question can be answered. (1) From "A Thrilling Adventure: The Kidnapping Expedition of Miss Elvia M. Bell." Greensboro Patriot, Greensboro, NC, June 29, 1899, p. 1. Reprinted in: "A Tarheel Heroism: Extraordinary Case of Successful Kidnapping." Henderson Gold Leaf, Henderson, NC, July 20, 1899, page 1. (2) "Stories Told of Belle Boyd" by Edna Bell Case. Greensboro Telegram, Greensboro, NC, Nov. 17, 1900, p. 2. (3) "New Song for Hoosier Expatriates." Star Press, Muncie, IN, December 10, 1922, p. 26. (4) "To 'Laddie Boy'" by Edna Bell Seward. Wausau Daily Herald, Wausau, WI, Aug. 31, 1923, p. 6. Edna submitted her poem from Highland Park, Illinois. I have found a Fannie Georgia Stroup and I hope that she is the same Fannie Georgia Stroup throughout the records that I have found. I'm pretty confident in most of this. It's the transition from California to Chicago (or Kansas to Chicago) that seems a little uncertain. But then there is a gravestone for her in Illinois. The name and birthdate on the stone fit the facts of Fannie's biography. Maybe sometimes things really are as simple as they seem. Fannie Georgia Stroup was a writer, a teacher, and a teacher of teachers. She was born on March 16, 1882, in Liberty, Missouri, to George W. Stroup (1856-1886), a farmer, and Louisa D. "Lula" Stroup (1860-1932). Her parents married in about 1881 and had two daughters, Fannie being the elder, Anna May Stroup (1886-?) the younger. They all lived together in Osage Township, Miami County, Kansas, at the time of the Kansas State Census of 1885, but that way of life came to an end with George Stroup's death in 1886. Lula Stroup remarried sometime after her husband's death. In the state census of 1895, she and her daughters were in Osage Township with her second husband, William H. Addy, (1848-1920), who was also a farmer. By the time of the 1900 U.S. Census, Fannie, at age eighteen, was teaching. Also during that year she attended (or possibly taught at) a school called Brush College. From 1900 to 1902 or after, she taught at Boicourt, Keokuk, and Moneka, all in Linn County, Kansas. She was at Linn County Normal School at about the same time and in 1907 taught at the Frantz school, also in Kansas. That's a lot of trivia adding up to not very much. However, it indicates that Fannie Stroup, who called herself F. Georgia Stroup (perhaps after her father), was pretty well on her own once she reached adulthood. That changed on April 25, 1909, when she married William Harvey "Will" Morrison (1879-1946) in Fontana, Linn County, Kansas. In the week after their wedding, the two went to live in California. In the census of 1910, they were in Redlands, where he worked as a farm laborer and she as a teacher. By 1920, he had worked his way up to being a police officer in the city. She, on the other hand, was an orange packer. He kept working his way up, eventually to become chief of police in Redlands from 1935 to 1942. She, on the other hand, ended up in a grave at a mental hospital in Illinois. The split between F. Georgia Stroup and her husband came sometime in the late 1910s and was final by 1930 when she was living in Chicago and working as a forelady at a lamp shade factory. William H. Morrison had another wife by then and was ensconced at Redlands. So what made Georgia move to Chicago? No one can say, for she was one of countless millions of people who have been swallowed up by the black hole of the past--millions who have left not a trace of themselves other than in public records and perhaps a granite monument in some lonely graveyard. F. Georgia Stroup left one more thing, though. She left a story called "The House of Death," published in Weird Tales in the magazine's very first issue, March 1923. Did that story arrive on the editor's desk from California? From Kansas? Or was she already in Chicago by 1923? If I had to guess, I would say that Georgia returned home, to Kansas, after her California adventure, including her marriage, came to an end in about 1920. As one piece of evidence, I have a non-fiction piece called "Iron Rust," written under the byline F. Georgia Stroup Morrison and published in the Stockton Review, Stockton, Kansas, March 2, 1922. That article may be the only other piece of her writing still in existence. Again, by the time of the 1930 census, F. Georgia Stroup was in Chicago. She was counted again in the same place in 1940 but did not give an occupation. She also provided a little more information that was previously lacking in census records: she was in fact divorced and she had received only an eighth-grade education. Also, she let us know that she had lived in Chicago in 1935. Born in the spring, F. Georgia Stroup died in the fall, sixty-six years ago today, on November 14, 1952. In this week of remembering, we can remember her, too. She lies buried at State Hospital Cemetery in East Moline, Illinois. Presumably she died there, at East Moline Hospital. 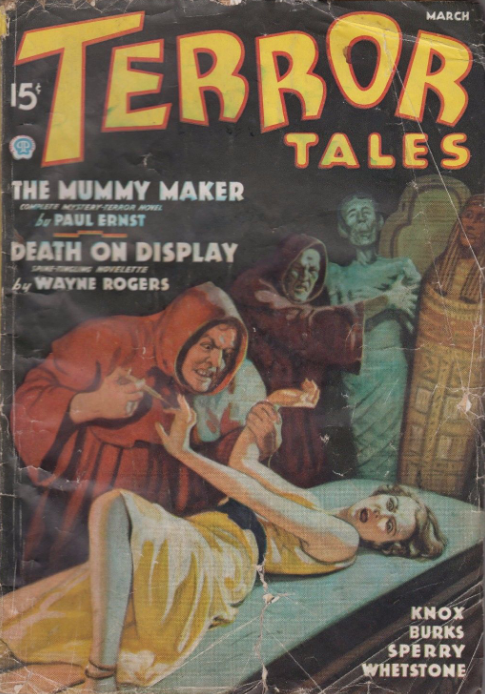 Norman Elwood Hamerstrom (1899-1970), who also contributed to Weird Tales, died at that same hospital and may very well rest in the same place. This is a year of two anniversaries divisible by one hundred years each. Two hundred years ago, Frankenstein; or, The Modern Prometheus by Mary Shelley, in which a man (or semi-man) is assembled from corpses, came out in an edition of 500 copies. One hundred years ago today, at this hour (my local time), the Great War, in which millions of men had been reduced to corpses, came to an end. Both were momentous events. One was a work of art, thus of life and creation. The other was a great and horrifying work of death and destruction. In 1818 and 1918, these were recognized as opposites: life and death, creation and destruction. On a much smaller scale, both had a great influence on the evolution of fantasy and weird fiction. Some people consider Frankenstein to be the first novel of science fiction. From it and similar books--books more properly called romances--came tales by British and American authors, chiefly Edgar Allan Poe, that led to weird fiction. And it is from Edgar Allan Poe that Weird Tales, no doubt named for a collection of his works published in the 1890s, is descended. But would there have been Weird Tales without the Great War? It's impossible to say. But in that war, horror, death, mutilation, and destruction met and in some ways became allied with art. I have recently read a book that makes that claim at least, and I have a hard time seeing that its author was wrong. The book is called Art and Fear. The author was Paul Virilio, who was still living when I read it a couple of months ago but who has since died, on--of all days--September 10, 2018, the day before an anniversary of mass death and horror could revisit the world. (1) Art and Fear is a slim volume, published in 2006 by Continuum of London. It consists of two essays drawn from talks given by M. Virilio. Here I'll consider the first, "A Pitiless Art." Four years ago, I wrote a series called "What is the monster of the twenty-first century?" My conclusion was that the zombie, representing mass man, in other words, all of humanity in our mass age, is that monster. Lately, though, I have seen signs that the zombie is fading. For example, we're already into the last season of The Walking Dead (supposedly), and it looks like zombies are going to lose their main television venue. Sorry, zombies. I have also seen signs that another monster for the twenty-first century could be on the horizon. Some people think that Artificial Intelligence (AI) or robots armed with AI will turn against us and seek to destroy us. Maybe. But maybe AI is a red herring. Maybe the next monster will be inclusive of AI but be something else instead. Maybe the new monster of the twenty-first century will be the transhuman, or, perhaps more accurately, the man who makes him. Whether it will be or not, Paul Virilio foresaw the coming of the transhuman and the maker of the transhuman in the monstrousness and horrors of the twentieth century, a century in which terror, murder, mutilation, and mass dehumanization of men became like artistic expressions, one in which science and the arts fused in the creation of new ways of representing the human form, not in stone or clay, not on canvas or paper, but in the murdered corpse, the dissected, mutilated, or vivisected body, and in the genetically altered human being himself. At the dawn of industrial modernity, Baudelaire declared, 'I am the wound and the knife.' How can we fail to see that, in the wake of the hecatomb of the Great War, when Braque and Otto Dix found themselves on opposite sides of the trenches in the mud of the Somme, modern art for its part forgot about the wound and concentrated on the knife--the bayonet--with the likes of Oskar Kokoschka, 'the scalpel-wielding artist', before moving on through the German Expressionism of Der Sturm to the Viennese Actionism of Rudolph Schwarzkogler and his cohorts in the 1960s . . .
And so we have had a century not only of cruelty but also of terror, mass murder, self-destruction, dehumanization, and mutilation of the human form and the human person, much of it the hands of scientists (or pseudoscientists) operating beyond any previously observed or acknowledged limits. They are men without pity, practitioners of one of the pitiless arts of Virilio's title. They were and are technological giants but ethical pygmies, maybe even ethical amoebas. This is a key insight, I think, for as Gimpel saw so keenly, Hate--a new and special kind of hate--is an invention of modernity, more specifically, a materialistic and thoroughly scientified modernity, one that has replaced God with countless minor gods. "The demons of gothic pictures," as Gimpel put it, "are child's play." The gothic, the supernatural, the romantic, the traditional, the folkloric--all have been overtaken and left in the dust by modernity. This was the greater problem for humanity in the twentieth century, a far lesser one for weird fiction. I have written before about this problem and how one teller of weird tales, Fritz Leiber, Jr., tried to deal with it. Rothko killed himself in 1970, "exercising," Virilio wrote, "the most nihilistic of freedoms of expression: that of SELF-DESTRUCTION." (p. 21) In that, Rothko recapitulated other suicides by other artists and prefigured the suicides of many more to come. Sir Francis Galton, the unredeemed eugenicist, is back in the land of his cousin Darwin: freedom of aesthetic expression now knows no bounds. Not only is everything from now on 'possible'. It is 'inevitable'! Where will it end? I suspect it won't, as "end" requires limit. There are and will be no limits in men who lack all moral and ethical sense. And so, as Mary Shelley foresaw two hundred years ago, as the men who lived through the Great War foresaw a century ago, and as Paul Virilio foresaw at the beginning of the current century, we will have things among us that cross boundaries, between man and animal, between man and machine, between man and monster. These will be transhuman. But will they be the real monsters among us, or will that role be played by the men who create them? Who in Frankenstein was the real monster, the creature or the creator? The problem of transhumanism goes deeper than that, though. If we say that the transhuman or the creator of the transhuman is the monster, we remove the problem from ourselves. We are absolved. We can say to ourselves, Those people over there are monsters. But not us. We are good. Remember Virilio's premonition: "[S]urely we can see what comes next [. . .] an officially terrorist art preaching suicide and self-mutilation thereby extending the current infatuation with scarring and piercing. Or else random slaughter, the coming of a THANATOPHILIA [. . . .]" The signs are all around us. We are full of hatred, each for himself, all for all, all for humanity, for human history, culture, society, and civilization. And because of those hatreds we rush to negate ourselves, mutilate ourselves, destroy ourselves, or else commit murder, mass murder if we can, but murder nonetheless. We can point fingers and say that the transhuman or the men who will create him will be monsters, but what will stop us from rushing to those same creators, begging them to mutilate us, transform us, turn us into monsters, anything so that we might be something other than what we are in this hated thing? Are we not attempting transhumanism ourselves? And if the transhuman is a monster, what does that make us? Paul Virilio did not mention Frankenstein in his essay, yet by strange coincidences, the connections are made in this year of a centennial, a bicentennial, and his passing from the earth. I am an artist. I can tell you that what Virilio described among artists is an actuality. I have seen so much hatred, violence, cruelty, nihilism, and destruction in the work of artists I have encountered. There isn't any question in my mind that they hate not only themselves but also life, God, the world, and the rest of humanity. Not knowing what they are or hating what they are, they engage in the everyday self-mutilations of tattooing, piercing, and scarring. And now we have people having their bodies surgically altered. Anything, they seem to be saying. Give us anything so that we don't have to be what we are. These things are the drip, drip, drip of suicide and self-destruction. If they could, these artists might very well commit murder. Short of actual killing, they commit murder in their art. It is an art of extreme cruelty, extreme violence, extreme destruction. Artists once provided warnings against such things. They were human, not anti-human. Artists and thinkers operating within limits foresaw that the transhuman and his extreme-scientist/extreme-artist creator, operating without limits or beyond limits, would prove monstrous. But then, in the twentieth century, the artist joined the scientist and the war-maker as one of a class of destroyers. Those who lived and operated within limits, before limits were destroyed, may have failed to see that we might all wish to be monsters, but we will be. Unless we draw back, unless we recognize limits, unless we say no to death and destruction and yes to life and creation. (2) And they're still carrying on quite well, despite their sickness, on their march to self-destruction and the destruction of Europe. 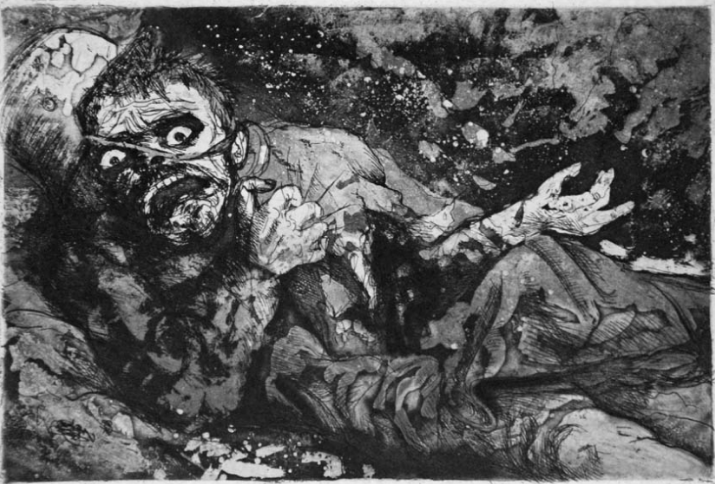 The Wounded Soldier by Otto Dix, 1917. 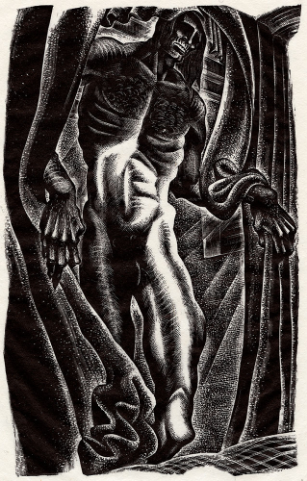 An illustration for Frankenstein by the American artist Lynd Ward (1905-1985). Labels: Friedrich Nietzsche, Mary Shelley and Frankenstein, Weird Tales and World War, What Is the Monster of the Twenty-First Century? Paul Ernst lived a long life and enjoyed a long career as an author of stories published in popular magazines. The FictionMags Index has his first story as "Lights Out," published in Breezy Stories in July 1926. (He was then twenty-six years old and presumably living in Chicago with his mother.) Wikipedia gives a very late credit, a short story called "Blackout" for Good Housekeeping, July 1971. (Then seventy-one years old, he was presumably living in the Tampa Bay area with his wife.) In the intervening forty-five years, Ernst penned hundreds of stories for Amazing Stories, Astounding Stories, Breezy Stories, Clues Detective Stories, Dime Mystery Magazine, Droll Stories, Ghost Stories, Horror Stories, Mystery Stories, Nick Carter Magazine, Popular Detective, Racketeer Stories (who knew there was such a thing? ), The Shadow Magazine, Terror Tales, and dozens of other titles. Under the byline Kenneth Robeson, Ernst wrote two dozen tales for The Avenger magazine. He was the ninth most prolific author of stories appearing in Weird Tales. As pulp magazines faded, Ernst sold stories to The American Magazine, Cosmopolitan, Good Housekeeping, Redbook, The Saturday Evening Post, and Woman's Home Companion. He wrote love stories, detective stories, crime fiction, weird fiction, science fiction, tales of terror and horror (also called weird menace), and the kind of mainstream fiction that appeared in women's magazines and slick magazines for decades after the war. In short, Paul Ernst wrote everything (everything but Westerns), and he kept it up for decades. And still, we know so little about him. Joel Reeve, Pseudonym of William R. Cox (1901-1988)-A prolific author of Westerns, mystery stories, and sports stories, Cox was working on a Western on the day of his death at age eighty-seven. Wyatt Blassingame (1909-1985)-Another prolific author of adventure stories, crime stories, and detective stories, as well as of tales of terror and horror. Theodore Tinsley (1894-1979)-A third very prolific author of crime and detective stories. Tinsley also wrote a number of stories of The Shadow for that character's self-titled magazine. Norvell Page (1904-1961)-A veteran newspaperman and pulp author, Page is most remembered for his many stories of the The Spider. He also wrote tales of heroic fantasy, one of which was adapted to Marvel Comics' Conan the Barbarian in 1973-1974. Margaret Scott (1898-? )-According to the article, Margaret Scott was the sister of Mrs. Wyatt Blassingame, otherwise known as Gertrude (Olsen) Blassingame. I have found Margaret Scott in public records. Her name was actually Margurete or Margurite Olsen, but she wrote under the pseudonyms Margaret Scott, Rita Dever, and (with Will Oursler) Gale Gallagher. Her stories appeared in The Household Magazine, Liberty, Triple Detective, and confession-type magazines. Kreigh Collins (1908-1974)-Although he wrote adventure stories for boys, Kreigh Collins was and is most well known for his work as a comic strip artist, illustrator, and painter. He created a number of beautifully drawn comic strips, including Mitzi McCoy/Kevin the Bold (1948-1972). Frances Mallory Wykes (1905-1990)-Born in Evanston, Illinois, Frances Mallory Wykes lived in Florida for many years. She was the author of novels, including Wings in the Sun (1941) and The Lady and the Looking Glass (1955). She was married to Frederic Kirtland Wykes (1905-1982), who illustrated Wings in the Sun. Fanny Herron Wingate (dates unknown)-A poet whose work appeared in magazines and newspapers. Dr. James M. Stifler (1875-1949)-An authority and author of books on Benjamin Franklin, Stifler was a Baptist minster and a secretary of the University of Chicago (1935-1940). He's not the kind of man I would expect to hang around with a bunch of lowly pulp writers, but who said they hung around together? Maybe they all just wintered in the same place. Dr. Binford Throne (1873-1952)-Dr. Throne was an expert on skin diseases and served as a physician in New York City for many years. He wrote in his area of expertise for various medical journals. Talbot Mundy (1879-1940)-Pulp writer and adventure story author Talbot Mundy also wintered at Anna Maria Key . . .
Walter Lippman (1889-1974)-As did journalist, author, and commentator Walter Lippman. So Paul Ernst didn't labor away in isolation and obscurity, but the image of a group of writers wintering on the golden coast of Florida in the mid 1940s is so powerful that I want to go there and be among them. Golden days like that may be lost forever . . . 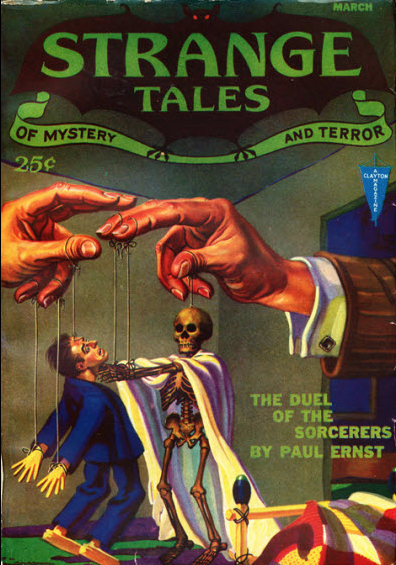 Anyway, Paul Ernst wrote thirty-eight stories for Weird Tales, the first being "The Temple of the Serpents," from October 1928, and the last being "Outbound," from September 1945. Ernst wrote one of these stories, "The Way Home" (Nov. 1935), under a pseudonym, Paul Frederick Stern. Among his other stories was the five-part serial "The Black Monarch," from February-June 1930. Ernst also contributed four stories to Oriental Stories and one to The Magic Carpet Magazine, plus one letter to "The Eyrie," the letters column of Weird Tales. Eight of his stories for "The Unique Magazine" were in the Doctor Satan series. As mentioned, he also penned twenty-four stories about the series character The Avenger for the magazine of the same name, from 1939 to 1942. All or most of these appeared as reprint paperback editions in the 1970s under the Warner Paperback Library imprint. I wonder what happened to Paul Ernst's papers after his death in 1985. Could they have been destroyed? Or are they still out there somewhere? If nothing else, we have his hundreds of stories, all that remains of his life on this earth. 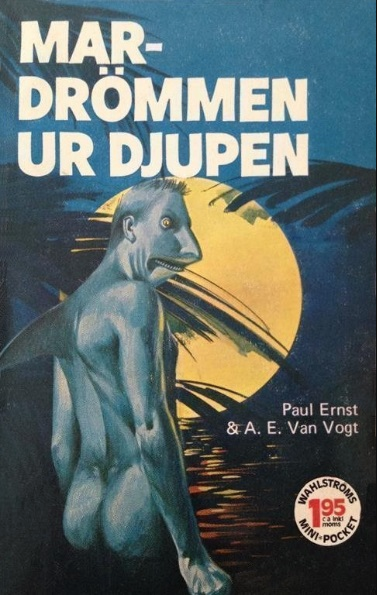 I'm afraid there's nothing much on the Internet on Paul Ernst except for lists of his stories on the Internet Speculative Fiction Database and The FictionMags Index. The Encyclopedia of Science Fiction has a brief article on him cautioning against confusing him with other authors of the same name. That makes me wonder if The FictionMags Index, and consequently I, have him confused with the other Paul Ernst. Anyway, there is also Robert Weinberg's long-ago collection, Dr. Satan (Pulp Classics #6), published in 1974. (1) "Nationally Famed Authors Form Winter 'Colony' at Anna Maria Key," Tampa Times, January 21, 1942, page 19. A gallery of covers illustrating stories by Paul Ernst. 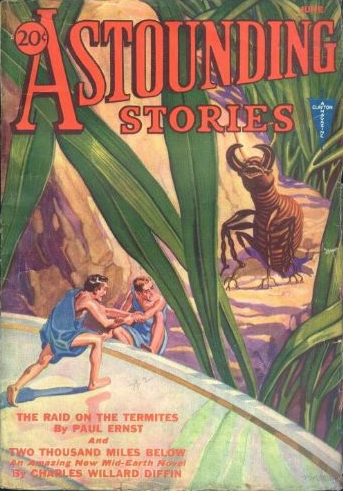 First, Astounding Stories, June 1932, with cover art by H.W. Wesso. 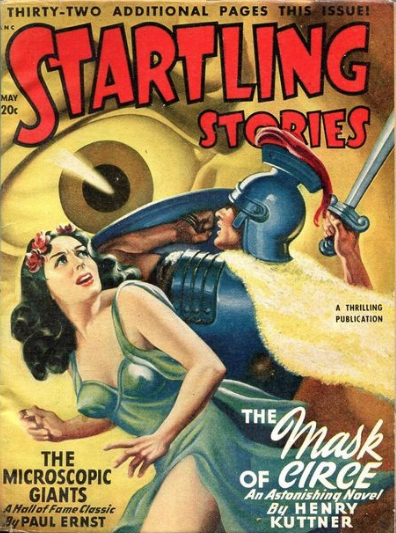 Startling Stories, May 1948, with cover art by Earle Bergey. Strange Tales of Mystery and Terror, March 1932, with cover art by Wesso again. Terror Tales, March 1936, with cover art by John Howitt. Note the red-robed cultists. 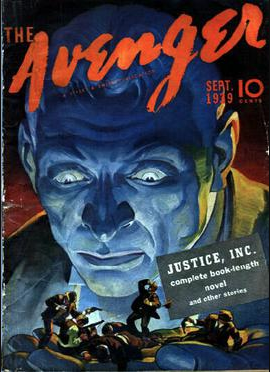 The Avenger, September 1939, with cover art by H.W. Scott. Finally, a Swedish edition, De mikroskopiska jättarna (The Microscopic Giants), published in 1973. I think A.E. van Vogt's byline is on the cover for his authorship of "The Sea Thing," which was originally published in 1940 and included in this edition. When I first looked at Paul Ernst a few years ago, information on his life was pretty well missing. That has changed, but Wikipedia still has his birth and death dates wrong. His biography on that website is otherwise spare. The Internet Speculative Fiction Database is better, but it has a link to the biography of another man (German actor Paul Ernst [1866-1933]) on the Internet Movie Database. It also has a link to the online Encyclopedia of Science Fiction, which has Ernst's place of birth wrong. (His place of death on that same website may or may not be right.) I guess the thing to do is to start with primary sources. First, according to Summit County, Ohio, birth records, Paul Frederick Ernst was born on November 7, 1899, in Akron, Ohio, to Louis C. and Nellie (Ticknor) Ernst. They had married on August 22, 1897, in Portage County, Ohio, and Paul was their firstborn and only child. Louis Ernst worked as a railroad postal clerk. His parents were immigrants from Germany. By 1910, Louis Ernst was gone. His widow Nellie, then working as a dressmaker in her own home, was in Chicago with ten-year-old Paul. She remarried on October 14, 1915, in Cook County, Illinois. Her new husband was George B. Kerr. He was nearly thirty years her senior. In the U.S. census of 1920, the three were living in Chicago, where Kerr managed a brass foundry. Paul Ernst, giving his age as twenty-two, was unemployed at the time. The next record I have for Paul Ernst is for a trip he made with his mother to Europe and back. On December 19, 1928, the two arrived in New York City from Naples. They gave their address as 540 Brampton Place in Chicago. That place seems to be no longer in existence. I have not found Ernst in the 1930 census, but in 1940, he was living in Buckingham Township, Bucks County, Pennsylvania, and working as a freelance writer. He was also married. His wife was named Martha, and the two let the enumerator of the census know that they had lived in the same place in 1935. She was the former Martha Jones, who had lived in Chicago with her parents. In 1930, she was single. That narrows down the marriage date for Paul Ernst and Martha Jones to the period 1930-1935. Ernst was in New Hope in Bucks County, Pennsylvania, in 1942 when he filled out his draft card. At five feet, ten inches tall, he was a slight 140 pounds. I guess it's no wonder that the facts in the life of Paul Ernst are so hard to come by. His parents died before he reached mid life. He didn't have any brothers or sisters. He also didn't have any children as far as I can tell. His first wife died before him. And, finally, his second wife, whom he had married late in life, had been married before and had only a daughter, in other words another family apart from him. In any case, Wikipedia is wrong, the Internet Speculative Fiction Database is right but has an errant link, and the Encyclopedia of Science Fiction has his dates right but at least one of the places wrong. Here's hoping that corrections are on the way. Oh, and by the way, today would have been his 119th birthday, so Happy Birthday, Paul Ernst! (1) Tampa Tribune, May 3, 1989, p. 110. (2) Tampa Tribune, September 24, 1985, p. 20. According to public records, Ernst died in Pinellas County. I assume he died either at home or at a local hospital.